There's a huge difference between a cast & hope specialist and a precision bomber when it comes to properly fishing a salmon fly. Here's a few basic fly movement thoughts to consider while presenting a salmon fly to the Scottish rivers. To start with you should view your salmon fly as your extended right hand as an offering of a 'hand shake' to a salmon! 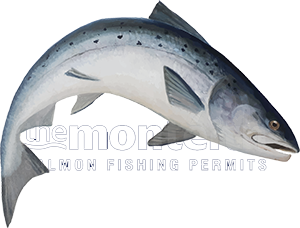 That offer to a salmon needs to be an open one and delivered with consistency, persistency and a 'genuine' belief that your salmon fly is optimally swimming throughout the full course of the fishing day to a degree where you can actually visualise its glinting, darting & tantalising waggling under the waterline. If you start to adopt this 'fly mentality' you'll already be in the top 5% of Scottish salmon fly fishers and you'll have now entered a new dimension in salmon fly fishing. This process of visualisation should in all cases start at the riverside before final salmon fly selection time if you're taking this business seriously. Don't just tie on any old fly just because it's the correct pattern and size as that's telling you nothing about the fly's actual movement. Before you commit to any fly tie it onto a leader and get it wet in the river to see how it moves in the stream. If it's not got a stream 'live bait' style movement of its own then put it in the bin and try another one! Be ruthless as the bottom line in this game is you only ever need 2 or 3 vey good salmon flies to have a 'bumper' salmon fishing season! You must have complete and utter 'faith' in the fly you're using for it to become a trusted member of your salmon fishing approach & kit. When you establish that professional bond nothing will stop you from catching salmon as long as you're reasonably well presenting that fly to the river in a methodical and well spaced fly swing manner and at the right depth & pace as dictated by the prevailing water conditions. Honing in on your salmon fly's natural stream movement then maximising a carefully thought out water coverage plan is without any doubt the most lethal approach for breaking the boredom of your landing net! Don't be robotic in salmon fly fishing and just go through the motions as your success rate will be minimal. Go to the next level of salmon fishing curiosity and know your fly's natural stream movement and know the 'glint ratio' from any bling that the fly's wing has tied into it. The best 'glint ratio' I've personally found is an occasional glint once every 3 to 5 seconds so don't fish a fly that's been overdressed with the glittery stuff that looks like it's permanently got its head lights full on! Go for the more subtle lesser 'bling'ed version as the occasional glint not only catches a salmon's eye better but I'm convinced is the defining moment 'trigger' as a salmon is tailing the fly that seals the deal via a positive fly attack!